DM series monitors are equipped with FSI's most advanced feature set, capabilities, and panels. They are purpose built for critical image evaluation in any professional environment. 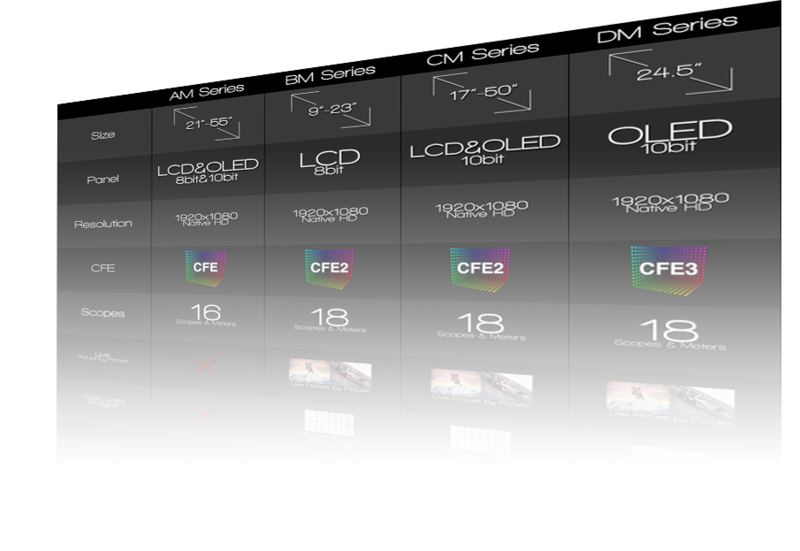 Zero Delay processing mode makes DM series monitors an ideal choice for applications requiring instantaneous video processing speed and the CFE3 Color Fidelity Engine allows for realtime LUT manipulation and second screen output. The 65” Flanders Scientific XM650U is a professional large format OLED reference monitor designed for color critical monitoring of 4K, UHD, and HD signals. It is equipped with 12G/6G/3G/HD/SD-SDI inputs and outputs ensuring compatibility with virtually an SDI interface. With new models added to our lineup, this comparison table will help you choose the Flanders Scientific Monitor that is right for you.